Pottery, Nurdling and much more to scroll down through! Bill's business Artseeker Ltd is closing down in 2019. Bill works as a studio potter. 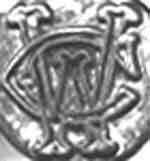 This is his potter's mark, found on all his work. It is made using his grandfather's sealing wax seal - William Crumbleholme. Bill works with the Ancient Wessex Network, creative people and organisations that work in the Heritage Industry. This is a YouTube clip of Bill throwing a batch of replica beakers on the potter's wheel. There is no sound track. 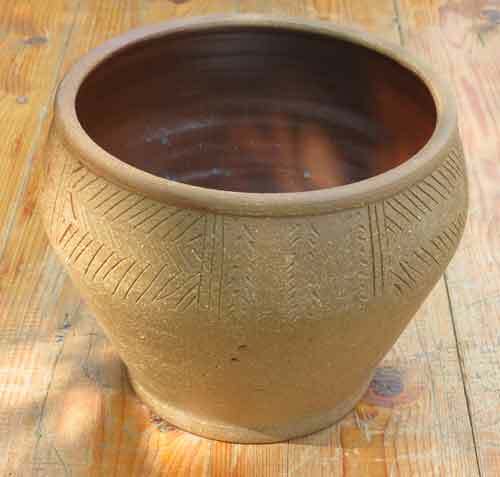 A pot inspired by Neolithic Grooved Ware. 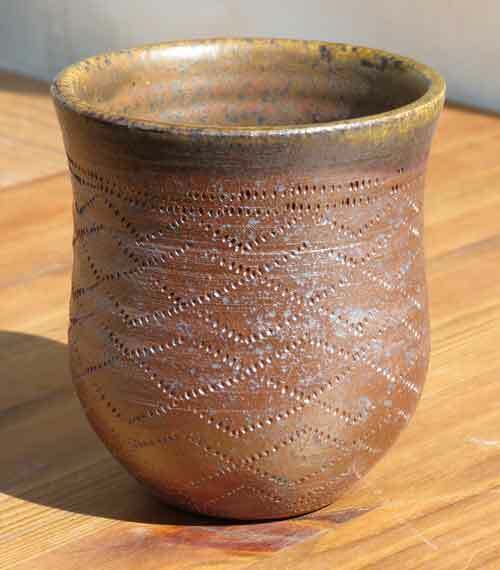 Bowl inspired by Iron Age Glastonbury Ware. to see their website with latest news and details of Exhibitions & Workshops. 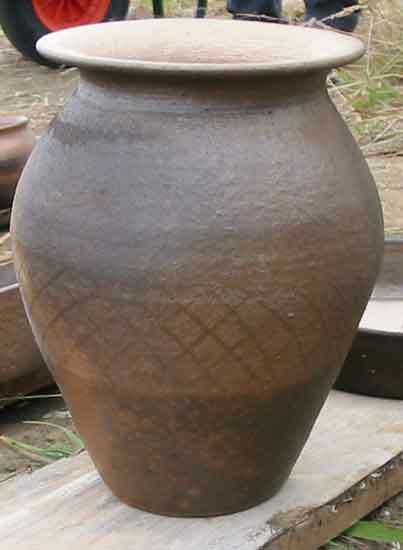 Bill built "Woden" - a large wood fired kiln - which is enabling him to produce more larger vessels. 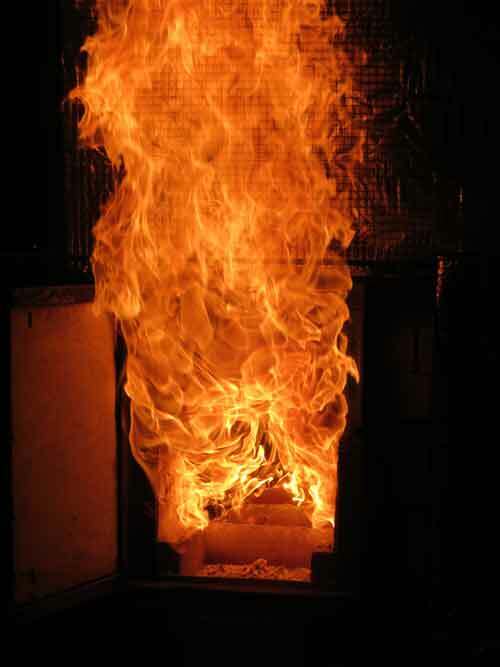 Take a look at the archive of the building and firings at this link. Bill runs pottery classes, currently with a very long waiting list. 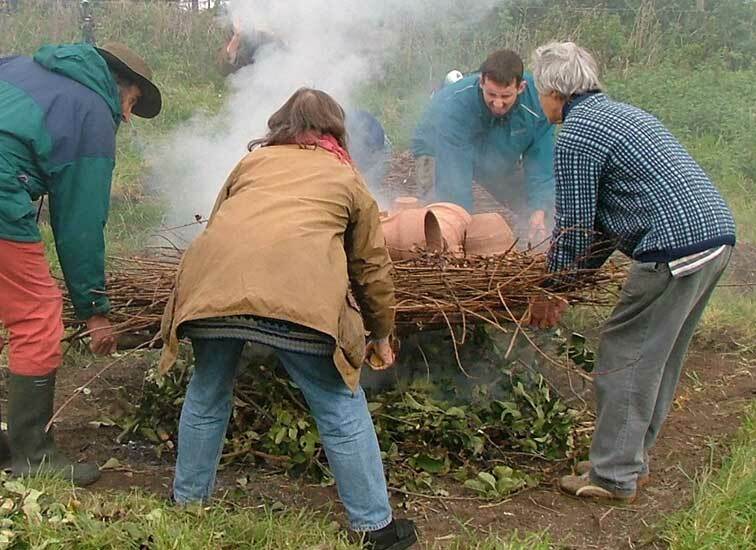 Bill is developing a range of cremation urns for use at the Higher Ground Meadow natural burial ground, where a large bronze age style barrow is being built. Bill's big brother, Richard, has done the Crumbleholme family history research, which has been uploaded to the www.crumbleholme.com domain. This includes the ancient origins in Lancashire and the William Crumbleholme put in the Tower of London for his religious beliefs. Richard is also an authority on the Windmills of Dorset (well it gets him out of the house now and then!). Take a look at the researches on the Dorset Windmills website at this link. This mosiac was made by Bill as a copy of one in the Dorset County Museum. 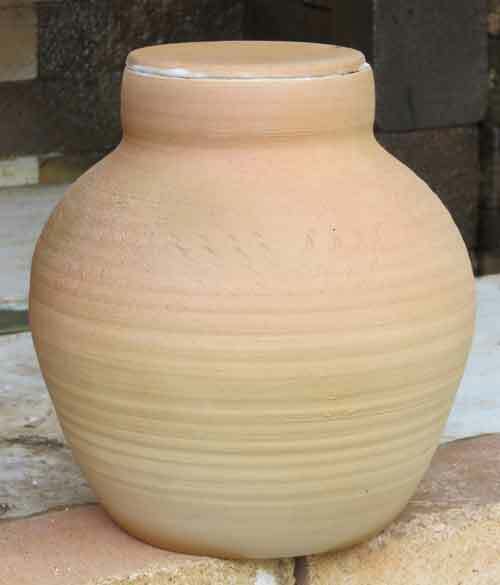 Much of Bill's recent output has been inspired by prehistoric pottery, to the extent that he occassionally dresses up as a Bronze Age potter and lurks about firing handmade urns in bonfires at "Historic Events"! 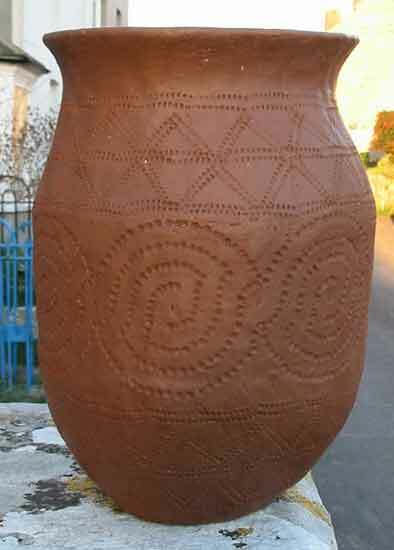 Beaker replica pots, made by pinching the clay from a solid lump, decorated with comb impressions. 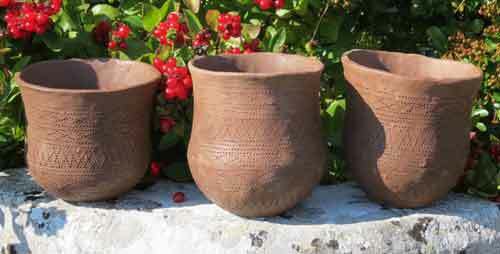 Visit webpages about Beaker Folk - based on Bill's research into Bronze Age artifacts and his experimental archaeology. Bill took part in the 2007 Inside Out Festival, appearing at Hambledon Hill - see here for what was involved. Take a look at this link to see a video of a bonfire firing of some replicas of Bronze Age Beakers belonging to the Amesbury Archer. Bill's 2003 project was at Bestwall near Wareham in Dorset. He rebuilt one of the actual Roman kilns uncovered by archeologists digging ahead of gravel extractors. Follow this link to see some more images. 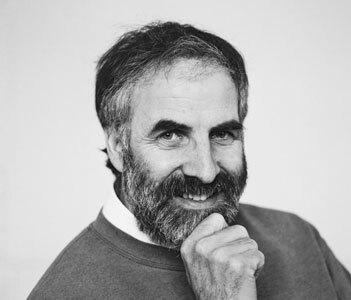 Bill is carrying out research into the production of Black Burnished Ware, Follow this link for more information. 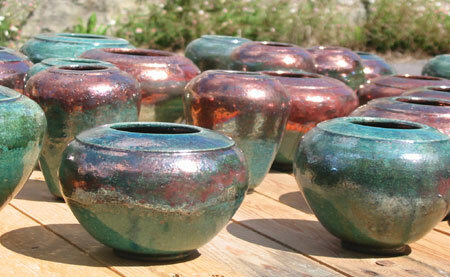 fired in the wood kiln. Follow this link to see more images. 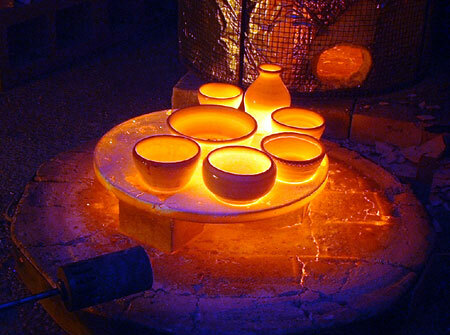 "Could've Fooled Me"are exhibitions featuring contemporary art works, staged at the Upwey Old School in early April and at the Monkton Gallery in early April 2006.
follow this link to see how they were made & fired. 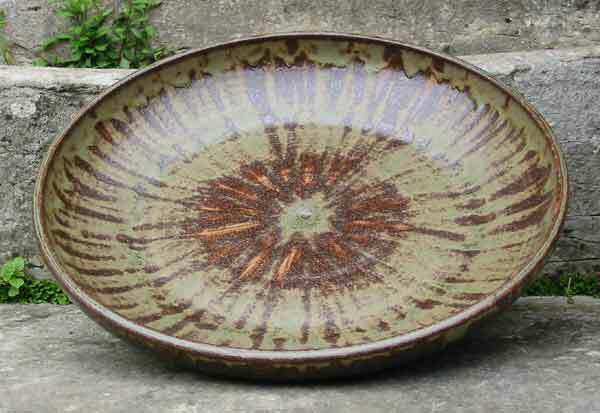 This dish has been glazed with radial stripes, where they overlap the different thicknesses result in different colours and opacities. 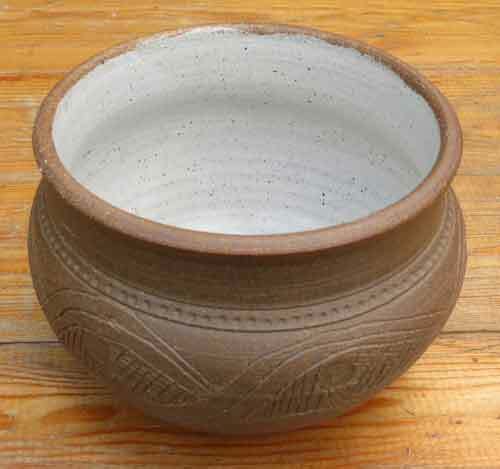 See some similar bowls here. All text and images on this site are copyrighted by Bill Crumbleholme, unless otherwise stated. Extracts may only be used with permission. Links to and from this site are welcome. This site is powered by Plus.Net. They provide Broadband connections and hosting facilities for the internet. If you want to check out their services, click on the link below. If you sign up for their services through this link, I will get a referral fee (at no cost to you).